Ah, they DO love old Karl, don’t they? 16 Responses to MARX WAS RIGHT! Have these people actually read anything Marx wrote? Or his mate Engels? Or Lening or Hitler or his economist Schacht, or any of the other socialists who claim to know better than the free market? Ar*eholes the lot of them. Good grief! Reminds me of the line from Red Dwarf about the Hitlers making wonderful hosts, providing you keep him off politics. If nothing else, now we’ve had the BBC offering house room to someone writing in praise of a murderous lunatic whose ideology is responsible for over a hundred million dead, can we at least have a moratorium on breathless Special Investigations into those nasty ‘right-wing extremists’? And that’s without getting into the deeper questions, like where’s the capitalism in Congress pushing banks to loan money to deadbeats, and why if ‘Victorian Values’ can’t last under capitalism, liberals are so anxious to indoctrinate kids into moral relativism almost before they’re out of nappies? 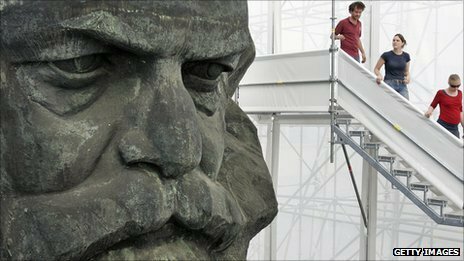 The great Theodore Dalrymple said somewhere that Marx spoke continually about “The People” in the abstract and saw them only as tools for his personal utopia to be enacted before his eyes. As the virtuous and enlightened took their grip on the State, so we`d get the benevolent wise rulers like Uncles Joe and Adolf…and we did! Dalrymple contrasts Marx with Turgenev..A Russian writer who spoke about “people”…small scale dilemmas, family, faith and freedom. When Marx died the Russians hated him-only the useful tools of Lenin etc would have anything to say about him later. His burial was ignored if not unlamented. When Turgenev died…the nation mourned. For Turgenev loved people…not “The People”…and Dalrymple warns us of ever trusting anyone who sees people in the abstract…start from Polly, Shirley and Vanessa and work your way down to the lower circle. cjh, I think you have nailed it. It supports my theory that socialists have a mental defectiveness. The People don’t exist. People do. I spent today watching my nephew playing football for a local junior team. I have no affinity with football, and I was there because I love my nephew. But, I saw something different from what I expected, while I was there for over 2 hours. I saw ordinary English people; adults and children; participating in something that they truly enjoyed. It didn’t involve a lot of money, it didn’t depend on what religion they were, or their size, height, or colour. It was the sheer enjoyment of people and their children being people. That’s what we gave to this world. And in many places in our benighted country, it is still there to be found and enjoyed. Perhaps if the bbc bottom feeders were to get a life outside their socialist fixation, they’d see us, the English, for what we have deservedly been admired for throughout the world. In the social field itself this provokes some rather odd consequences. For if you do not agree with the Marxist Doctrine, you are deemed not to be on the side of progress. The term of distinction reserved for those who have not been visited by the new revelation is the word ‘Reactionary’. Literally, the inference is that you are working against progress, in a backward direction. The dialectic process, however, ensures that you will be eliminated in due course, for progress must win in the end. This, then, becomes the rationale for violent removal of non-conformist elements. There is here a strong messianic streak in the political philosophy of Marxism. as the founder of an earlier creed put it, he who is not with us is against us. This is clearly not the principle of a democratic doctrine. Next week: Gordon Brown was right! You won’t be raving about Marx when the caliphate arrives, Beeboids. So that piece is taken from the Beeboid website. However, seeing those quotes gave me an immediate sense of having heard something very similar somewhere recently. Aha, I think I’ve got it…it sounds suspiciously like a talk by one John Gray that came on after Any Questions the other night. The Beeboid Corporation has ways and means of telling you what’s good and what’s bad for you. If they don’t catch you on the radio, there is always the website. The beeboids are high fiving at what they perceive as “The Collapse of the Capitalist System”. However, what they don’t admit (and wouldn’t acknowledge even under torture) is that the collapse occurred as a result of 13 years of socialist incompetence. It doesn’t matter how good any sytem is, if it’s run by idiots it will fail. The British Electorate needs to learn the lesson that a Capitalist System must be administered by capitalists. Ths socialists have bankrupted the UK by the end of both of their previous administrations (by 1979 and 2010). When will we learn? Maybe I should pop down to highgate on the tube and spray paint Marx with gold paint. Oh the luvies will have an heart atatck. I suppose they could dry their tears at the veggie cafe across the road. I mean only capitialists eat meat don’t they? If anyone wants to read a thoroughly critical analysis of why this programme was so bad then you might want to read this piece by Paul Marks over at Counting Cats in Zanzibar. Tar for the link to a great article i have never found that site before! The sheer stupidity of the childlike useful idiots within the BBC is surreal. Do these public school and Oxbridge educated boys and girls not realise that they are now the Establishment? That they themselves are the Bourgeoisie that the Lumpenproletariat would like to see swinging from lamposts? Capitalism has failed, insofar as it has been defeated by corporatism. We do not live in a capitalist system. Capital is massively hindered by tax and red-tape and unfair practice. Free market competition barely exists, and huge corporations are state funded and protected from competition in many ways. IF we had a capitalist system, The banks would not have collapsed in the first place. Moral Hazard would have prevented it. Under a real capitalist system, had any bank been so wreckless as those who were, then those Banks would have been allowed to collapse and then they would have been bought and broken up and the assets taken over by more responsible banks for cents on the dollar. Instead there have been trillions of dollars of tax-payers money spent in banking bail-outs over the past 3 years. Wall St corporatist corruption took over the capitalist system and turned it into an irresponsible corrupt ponzi scheme for years. When it could no longer support itself, it collapsed and was bailed out by the Government, WITHOUT ever asking the people. Basically, the global corporatist elite pissed away all their money on reckless gambling on unsustainable debts, fraudulently selling the same mortgages over and over in CDSs CDOs, sucking millions of people into unsustainable levels of debt with crazy promises of what was attainable, and then stuck all the responsible tax payers with the bill when it all collapsed. ‘Sfunny how the BBC’s ‘capitalism has failed’ trope does not preclude thousands of their staff ‘earning’ fantastically high salaries, pensions, expenses, bonuses, and flexibility allowances, whilst pensioners and the low-paid are forced to pay for this stinking largesse on pain of imprisonment. How are your socialist principles coming along, BBC, you hypocritical, greedy fucks.